The Alternative: Can Britain’s progressive parties work together? We are giving away four free copies of The Alternative to Left Foot Forward readers. Click here to subscribe to our email list and be in with a chance to win. Winners will be announced on 9 September. When progressive politicians — John McDonnell, Nicola Sturgeon, Caroline Lucas — crossed party lines to campaign together for a Remain vote, it seemed like a brief reprieve from the tribalism that continues to characterise left-wing politics. As in so many respects, we assumed that once Remain had won, everyone would climb back behind their barricades and things would return to normal. Instead, we’re facing a break with Europe and a country more deeply divided than almost anyone realised. We must accept that things won’t go back to normal — if normal ever existed in the first place. 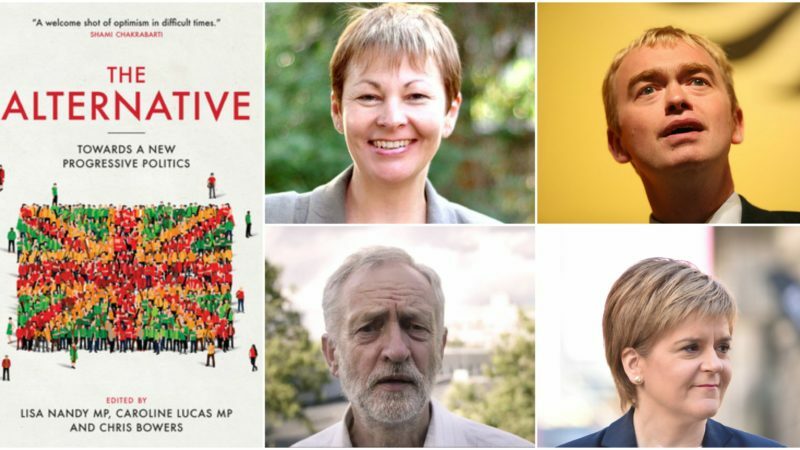 In The Alternative, a new volume of essays published by Biteback this week, this unlikely trio of editors (Labour, Green and Lib Dem) make the case for ‘a new progressive politics’, founded on cooperation between progressive parties, organisations and individuals. This is an idea whose time is rapidly approaching. As we face the prospect of a decade of unfettered post-Brexit Tory rule, more and more people are asking the obvious question: Why do so many parties, who agree on so much, spend so much time trying to take each other down? In the months since the referendum, we have seen the emergence of More United, a cross-party progressive political platform established by former Lib Dem leader Paddy Ashdown, and others. Caroline Lucas and Jonathan Bartley are likely to be announced as co-leaders of the Green Party, and progressive alliance-building was at the core of their leadership election platform. Even Labour, which ostensibly has the least to gain from progressive cooperation, is starting to change its tune. Shadow minister Clive Lewis publicly supported cooperation with the Greens, potentially expanding to the Lib Dems and SNP. In this book, voices from across the progressive spectrum contribute thoughts on the issues upon which such an alliance could be built, the form it would take, the challenges it would have to overcome, and the benefits it would offer the country. The first half is focused on shared values, ideas and policy concerns, such as environmental protection, a more people-centred economy, reduced inequality and more expansive public services. The essays include a passionate celebration of liberal immigration policy from Tim Farron, a defence of progressive internationalism by Peter Hain, a call to ‘put the security back in social security’ from Ruth Lister, and an essay by the SNP’s Mhairi Black on the lessons that progressives from accross the UK can learn from Scotland’s independence referendum. The second half deals with the knottier question of how to go about building alliances, in a political culture that offers little or no precedent for such relationships, and with a public that remains deeply sceptical of coalition. It is in some respects a how-to guide, with Duncan Brack providing an excellent overview of the collaboration between Labour and the Lib Dems under Tony Blair and Paddy Ashdown, and Andrew George outlining the forms that such cooperation could take, with possibilities that extend much further than electoral pacts or coalitions. Carys Afoko offers valuable analysis of why the Conservative economic narrative has been so powerful for much of the last decade, even though the facts do not support austerity, and outlines suggestions for more unified progressive communications. And politics professor John Curtice gives all complacent progressives a shake by questioning the platitude that Britain has a ‘progressive majority’ waiting to be convinced. While the book opens with a call for hope rather than despair, it as much analytical as aspirational, and doesn’t shy away from the challenges ahead. The editors recognise that across all the progressive parties there are those who deeply resent the idea of working together —Labour socialists who see Lib Dems as crypto-Tories, Greens who doubt Labour’s commitment to environmental and climate protection, Lib Dems who cannot countenance the SNP’s nationalism. Unsurprisingly, electoral reform is a core theme of multiples contributors, and Katie Ghose of the Electoral Reform Society has penned an essay dealing specifically with how electoral reform could best be achieved. This remains a sticking point between Labour and the Greens and Lib Dems, who not only object to the continuing use of a process that systematically disadvantages their candidates, but also point out that first-past-the-post benefits the Tories over Labour, and will do so even more after the 2018 boundary review. Interestingly, the SNP contributors to the volume are among those calling for electoral reform, even though it allowed them to win the vast majority of Scotland’s Westminster seats with a little over half of the vote. ‘First-past-the-post fails everybody, even those who win under it, because they have little or no legitimacy,’ writes Mhairi Black. This week, Labour leader Jeremy Corbyn has once again demonstrated Labour’s reluctance to act on this issue by launching a plan to democratise Britain ‘from the ground up,’ that didn’t include any reference to electoral reform. His challenger, Owen Smith, also struck a blow to the idea of progressive alliances this week, guaranteeing that under his leadership Labour will not cooperate with the SNP. Ultimately, even if the Lib Dems, SNP, Greens, Plaid and the SDLP all clubbed together, they would only be the third largest bloc in the House of Commons, well over 150 seats behind Labour. So the success of an alternative model of progressive politics will hinge largely on the Labour Party’s willingness to compromise and cooperate, neither of which it is currently renowned for. All things considered, the core proposals of this book may seem fanciful to some. However, the success of any idea depends on those willing to get stuck in, who seriously assess the possibilities for change and dare to hope that we can, eventually, do things differently, and better. For that, Nandy, Lucas and Bowers should be commended. And for those who don’t see how the historical divides between progressive parties can ever be overcome, the volume’s final page offers the compelling and sobering example of Northern Ireland. In Belfast, a faltering but functioning coalition has emerged from decades of bloodshed and bitterest hatred, comprised of members who have personally had to forgive past atrocities that devastated their families and communities. British politics currently inhabits a place of great darkness, but hopefully the authors of this volume are correct, and something more representative, participative and compassionate is about to emerge. 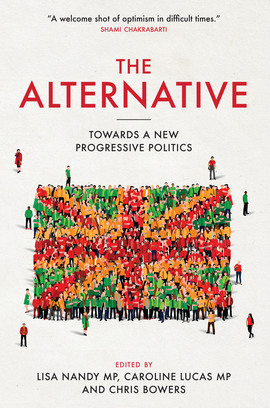 Click here to subscribe to our email list and be in with a chance to win one of four free copies of The Alternative. This all a bit naive! The SNP sail whichever way the wind is blowing. Remember that it is not too long ago they were called the “Tartan Tories”. The Greens are not interested in furthering the welfare of the working-class. Again they see the left as “useful idiots” from whom they can hitch a lift in furthering their objective of destroying our econmic prosperity. There is nothing ‘progressive’ about reducing the standard of living of the working class. As for the Lib Dems, well memories are rather short !! They have just come out of a 5 year coalition with the Tories. Was that ‘progressive’? The Labour Party is at war with itself, so to suggest it can ally with other parties is fatuous but quite amusing. Mr WALKER. Your description of the writer of this article is most apt. Fatuous but quite amusing. I would have punctuated after fatuous, but then, I am pedantic. I have read & welcome this article. The main aim for me from the Progressives will be to MOVE forward and not as with the present system of standing still or looking back. Hey, what about Plaid Cymru? I’ll hope for a Labour split after their leadership election – and maybe they’ll start changing their minds. Otherwise the Alternative is for “progressives” totally abstain from taking any part in the next GE. How else to get PR? CR your comments about theGreen party are without basis, I have been a member of the GP for 27 years & think your statement (The Greens are not interested in furthering the welfare of the working-class. Again they see the left as “useful idiots” from whom they can hitch a lift in furthering their objective of destroying our econmic prosperity. There is nothing ‘progressive’ about reducing the standard of living of the working class.) I was always seeing how they were very realistic about furthring the interests & success of working people even starting up small enterprises such as workers co-ops. The SNP are not a progressive party. They are a populist party who would have children back cleaning chimneys if it thought that would a) increase their vote share and b) aid their only raison d’etre, their quest for independence.